Need Central Heating Leak Detection in Cheshire? Did you know that your central heating could have a leak with no immediate signs of water damage? Sometimes the first hint that you have a central heating leak is your boiler dropping in pressure which can (after an extended period) cause it to cut out. 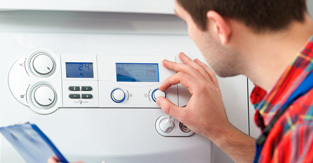 Low pressure is generally easy to diagnose as most boilers and central heating systems have a pressure gauge attached. Constant water pressure is integral to the working of your central heating systems and so if the pipes breach at any point this could spell trouble for your heating system. Here at Cheshire Plumbers we’re central heating leak detection specialists in Cheshire and surrounding areas. We know the importance of getting your central heating back in working order – especially if you have young children or we’re going through a cold patch, and so we provide a quick and cost effective service. We are also trained in using cutting edge central heating leak detection equipment, specifically designed so that walls and floors don’t need to be ripped up to find the leak. Instead of disrupting the entire area, machines are used to track the heat loss and thus pinpoint the leak area. Our highly skilled team will then repair the central heating leak, to get your system working perfectly again. We’re based in Congleton and so we regularly supply our central heating leak detection throughout the Cheshire area. If you have a problem with your central heating, or would like advice about our central heating leak detection please give us a call. We can provide you with a no obligation quote and answer any questions your may have. Central heating leak detection has never been easier with Cheshire Plumbers!